Anyone listening to their new amp yet? I'm interested in your thoughts once you put it in your home rig. I've listened to mine a bit once I got the Bias problem sorted. My initial impression is that it's quite good. I'm only using it as a single amp with Carver ALS/60" and it seems to do fine driving them at moderate volumes. I have not pushed it yet, still making sure my build is stable. It's very well balanced with the KT-120's, but I think more depth can be gotten by use of vintage power tubes/pre-drivers. 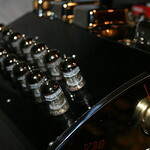 I rolled some vintage EI, Mullard and Telly 12ax7s in the front end. Very nice but I haven’t decided which I’ll run on a consistent basis. I have a bunch the V20s PO sent me when I bought it. He sent some 12at7s too I’ll roll in later. The presentation is very different compared to the EAR. Power of course, there is a remarkable amount of air around the instruments and a nice aura surrounding the vocalists. I’m using our LucasLabs(tm) pre and both Yggdrasil and my Fosgate Signature in front of it. The Mundorf SGO cap I nodded the M3s with is getting some hours on it and sounds a bit less frenetic than it did on install. The depth I had hoped the SGO would impart to the speakers is getting there. All and all, a very nice addition.